«I believe, behind every achievement lies story of struggle and at the same time, a helping hand for you to stand strong. Today when I look back at the time, I still remember the fear and hopelessness I had, as an 11-year-old child who lost her father in an avalanche on K2, Pakistan. The incident that almost engulfed my family into the quicksand of helplessness until we got an extending hand of support from the Benoit Chamoux Foundation. I feel very lucky and blessed to have a Godmother like Fabienne and the supporting team of the Himalayan Trust and the Foundation who worked their best to provide us education in some of the most prestigious educational institutes of Kathmandu. After the support I got from the Benoit Chamoux Foundation, I see my life as a journey through this amazing maze that had so many opportunities, learnings, encouragements on the way that today, I came out of it as a deserving student to hold such a prestigious award like ‘Student of the year’. Words are not enough to describe the gratitude and respect I’ve for Fabienne and the Benoit Chamoux Foundation. As a child, I always aspired to be a daughter that the foundation would be proud of. And I feel really happy that I have always had the support from the Foundation to reach at this phase. 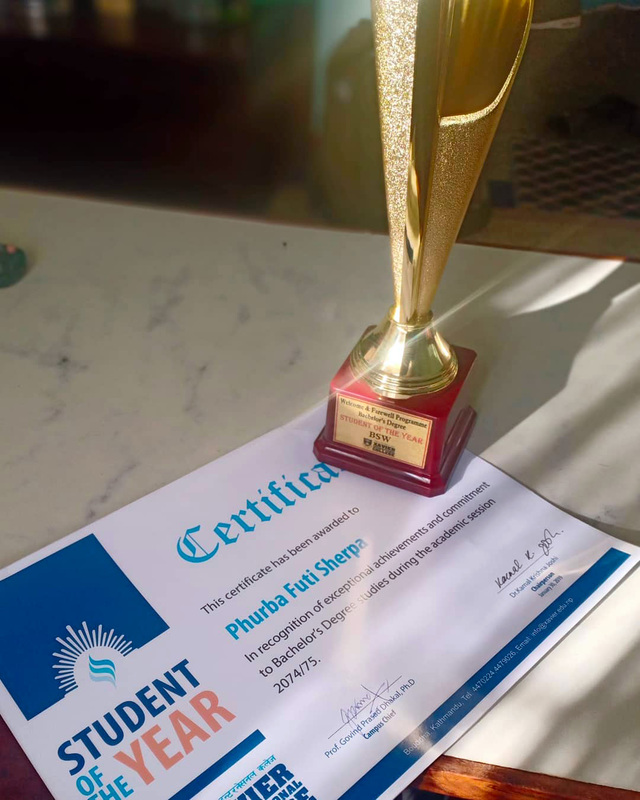 The college had awarded the trophy of ‘Student of the Year 2019’ based on the overall performance of the student which included academic progress, discipline, extra curriculum activities and other achievements. Being chosen to receive an honorable award like this among the whole Social Work Department was really an overwhelming achievement for me. This is also the final year of my Bachelor of Social Work and having to finish the college with so much of love and appreciation from everyone does make me feel really blessed.